A Missionary story you will never forget! The score is a wonderful mix of the classic Broadway style of songwriting and the pop style. From this website through our PayPal Shopping Cart for the internet special price of $11.99 (+shipping and Maine sales tax) Be sure to enter your zipcode where prompted on the PayPal order form. It will automatically calculate the shipping for your order. 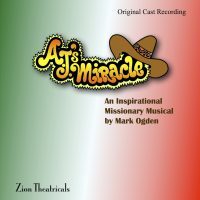 If you are interested in producing AJ’s MIRACLE onstage click HERE.